I am so happy to turn over my blog to a special friend of mine. 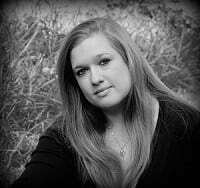 Melissa of My Recent Favorite Books, is a blogger, and avid reader, and a Autism Mom Warriors. 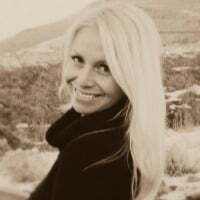 She is so kind and giving, has helped me find books to read, and has commented on each and every blog posts I have ever written, now that is support! 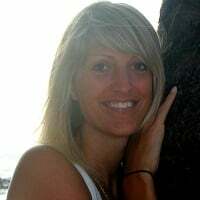 Welcome Melissa...I am honored and excited to turn my blog over to you today. 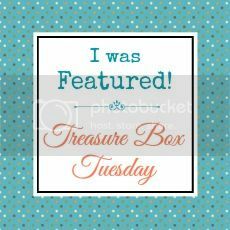 Thanks Kim for allowing me to be your Guest Post today! 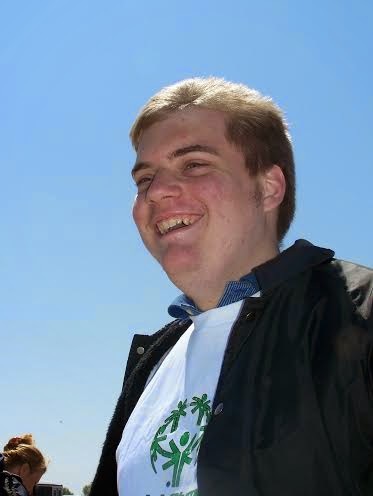 My son's name is Nicholas, and he was diagnosed with Autism in 1993. He will soon be 23 years old and is considered “non-verbal”, but he communicates in his own way. 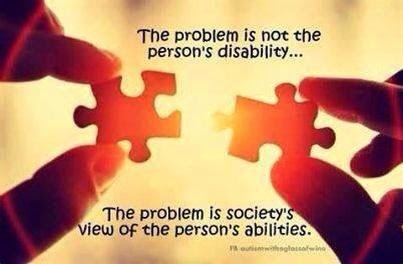 I can remember the day the doctor told me that he was Autistic; he was about 2 ½ years old; and at the time, I knew very little about Autism. In the past 20 years I have learned a great deal about Speech Therapy, Behavior Issues, Medication and Case Management. We value the support that we receive from my daughter, my son-in-law, the school that my son went to for 9 years, and several close friends that help us along our journey. Nicholas has many abilities at home and in the community. He loves to grocery shop, especially if we are getting his favorite things! Just yesterday we went to the grocery store, and as I was heading towards the check-out, I turned around and he was gone! He had been right behind me! I immediately wondered which aisle we might’ve walked past that would’ve caught his eye. I very quickly went back down the main aisle, looking down each aisle as I went. In just a moment, there he was, walking towards me with a bottle of his favorite shampoo. He had a smile on his face that said “I need this, is it OK if we get it"? Even though the shampoo was not on our list, I understood what he was doing. Although we have several other full bottles at home, I have realized that Nicholas is helping in his own way. 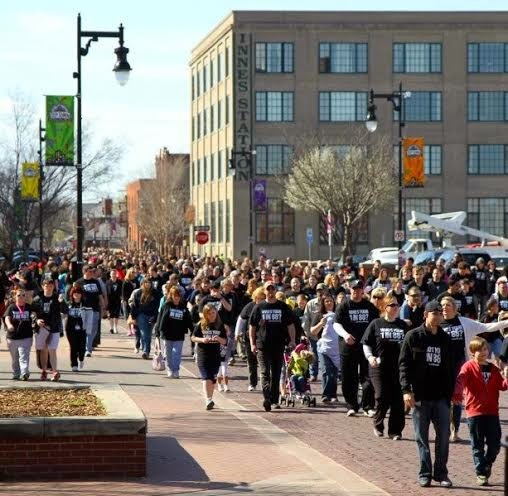 Next month, we will be participating in the AutismCare Walk, in Wichita, KS. This will be our fifth year participating. It is an event that helps raise funds and awareness for local individuals and families affected by Autism. 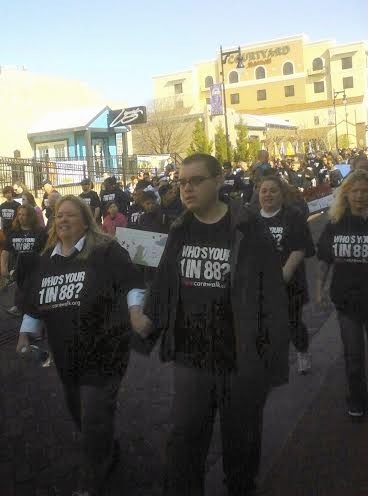 I look forward to the Autism Care Walk every year! I am overwhelmed at the outpouring of love that the families and the community show at each year’s Autism Walk! 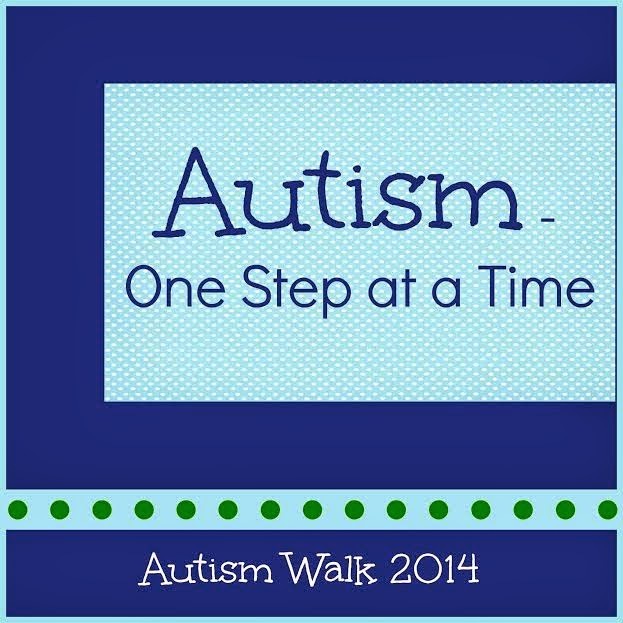 This year, I'm having an Autism Walk Fundraiser thru Thirty-One. 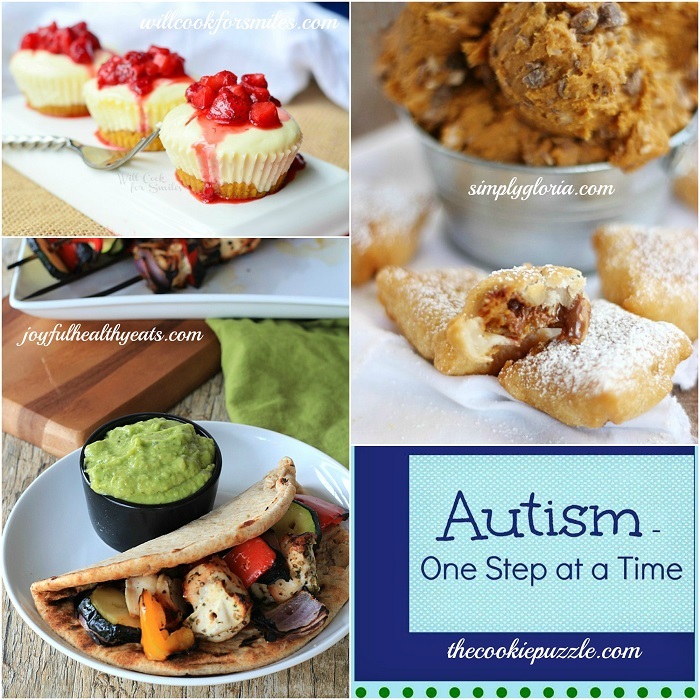 I will be donating 20% of all sales from my fundraiser to this year's Autism Walk. If you would like to make a purchase towards this fundraiser, please go to my Thirty One Website, and then click "My Parties" , and then click "Shop Now'. 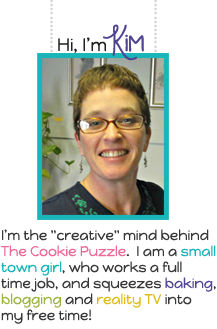 I want to thank Kim for having me Guest-Post today on her blog! 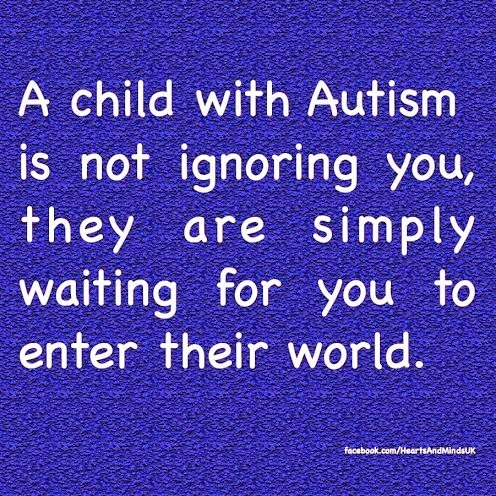 Thank you so much Melissa....you are a true Autism Mom Warrior! I know I will be placing an order with you for something at your Thirty-One Fundraiser....because no one can ever have too many bags....and ThirtyOne bags are so cute! I have become totally addicted to Etsy. You can buy just about anything there...cards...party supplies, cookie cutters, cake stands...it is like a virtual Estate sale or swap meet. LOVE IT! Because of Etsy, I have been trying to make a Friendship Bracelet. Do you remember those? I used to make them when I was younger, I remember them being fun and easy. Well, 30 years later...not so fun...and definitely NOT easy! OMG Ya'll....12 strands...complicated pattern, forward and backward knots. I have started and tossed 2 so far...but I am a person on a mission.....I WILL DO THIS! Stay tuned! Are you ready for March Madness? Me...Nope..not a fan of Basketball...sorry...hate all you want, but I will not be watching, no filling out a bracket, not watch parties, unless you want to come watch a Real Housewives of Wherever marathon, then I am totally down with that...come on over! Did you hear the rumors about the next season of American Horror Story? Circus? What? Really? Umm..not sure I feel about that. Clowns kinda creep me out. Today is the first day of Spring! Woot Woot! Now....could it please REALLY BE SPRING, because I am kinda sick of 30 degrees in the morning.....thankyouverymuch! There you go...what is keeping me up at night...my Thursday Thoughts! I totally wanted to post these yesterday, but I had 4 dozen cookies to bake and decorate on Sunday when I got home from church. So...I had to do what I had to do, but better late then never, right? Our church hosted Alan Sibley and The Magnolia Ramblers Saturday night. If you are a fan of Bluegrass Gospel music, I highly recommend them. They put on an amazing show! To have award winning musicians in our small church is such a blessing. You can find where they are going to be playing on their Facebook page. Our church hosts them a few times a year, and it is always such a wonderful show. We host a small reception after the concert, and we all bring desserts to share. I always try to come up with something new and fun. 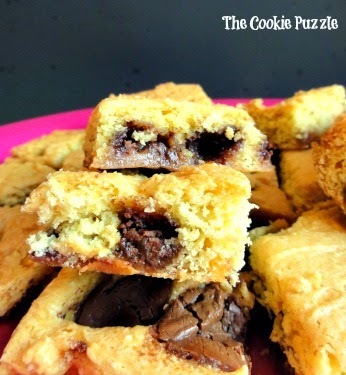 So I made a quick and easy Rolo cookie bar. 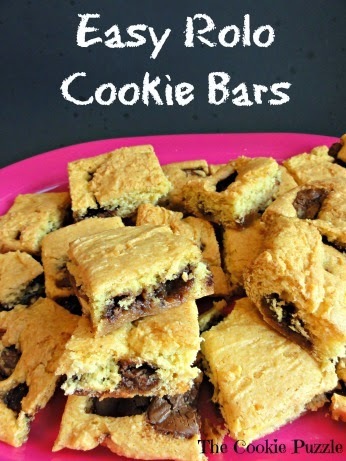 These are the perfect combination of a cookie and cake, so I called it a bar. The Rolos are really the star of the show though. Creamy, chocolaty, caramaly (is that a word? ), with a rich bar base. These bars have four ingredients in them, how cool is that? Really, if you happen to have Rolos in the house, you can make these. I picked up a ton of candy after Valentine's day...like 30 bags! I could not walk away, bags of Rolos, Kissses and Hugs for $1.00 and M&M's for $0.75! As a baking blogger, candy always comes in handy, and seeing at such a discount, I took the opportunity to stock up. 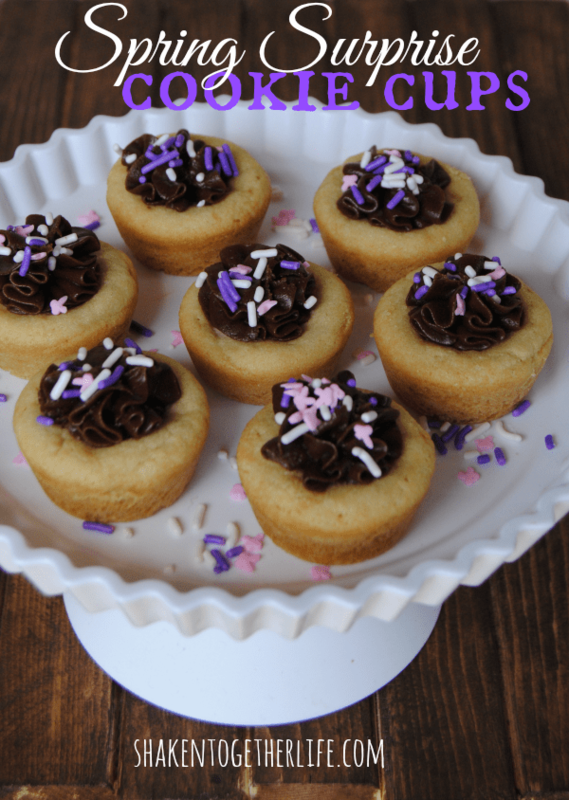 Yes the Rolos and Kisses were wrapped in Valentine colors, but that does not matter if using them in a recipe, right? That is my blogging/baking tip for you..buy candy when it goes on sale after a holiday. It is usually highly discounted and if you are using them in a recipe, no one will know. 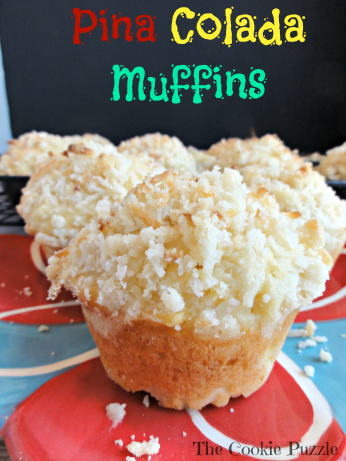 You save money and get to bake with products that are usually pretty expensive. 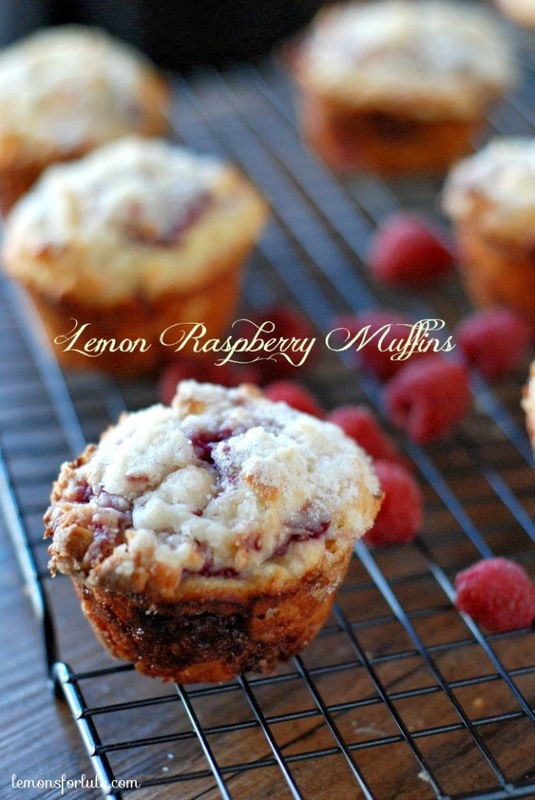 Make these...you will not regret it! Preheat oven to 350. Spray a 9x13 pan with cooking spray. 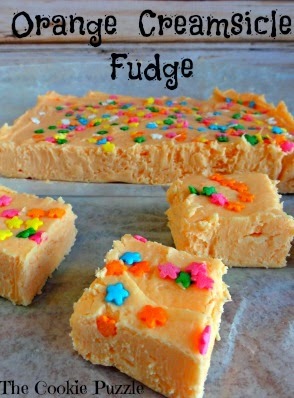 In a medium bowl, combine cake mix, milk and butter, mix well to combine. Mixture will be thick and a little sticky. Place a little more then 1/2 of the batter in the pan, spread evenly to the edges of the pan. Bake for 9-10 minutes until, until just set. Remove from oven. 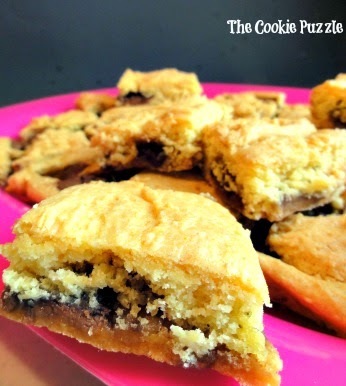 Press the Rolo Candies, cut side down into cookie bar. With a teaspoon, drop remaining batter randomly over the Rolo Candies. Return to oven and bake 24-26 minutes until the top is golden brown. Cool completely, cut into bars, serve. 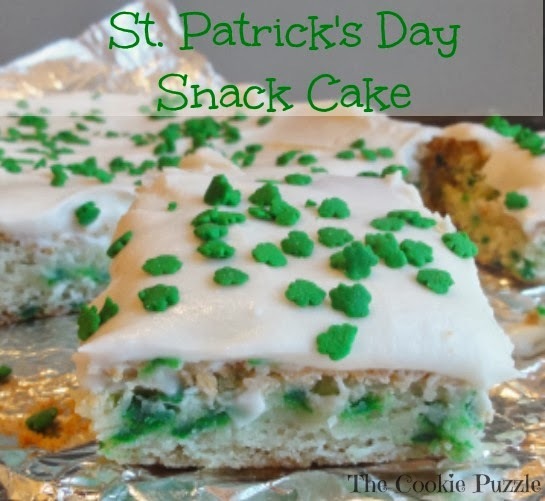 * I used a smaller 16.25 size cake mix rather then the 18.25 size used in the recipe that Baker Lady used, so I got a more cookie type of bar, then a cake bar, hence the name change. 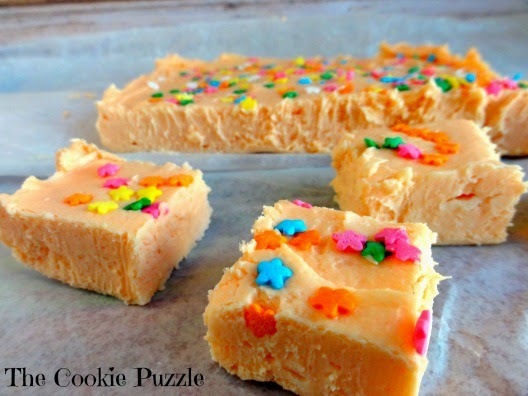 Using a large size cake mix, will yield a more cake like bar. Who is ready for sunshine. How about a nice spring rain that is followed by a beautiful sky and a colorful rainbow? Doesn't that sound pretty? It does to me, it really sounds good to me, because this weekend it was cold, and we had ice followed by snow. "The Sky". The first thing that popped in my head when I heard the theme was Rainbow. It was yucky outside, so I made a rainbow..and I can keep it forever! 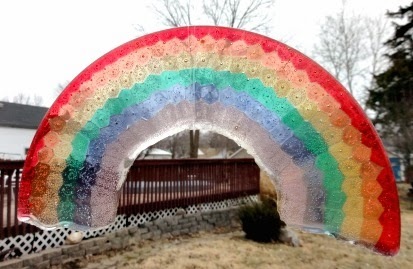 You can have a suncatcher of your very own, and it is really simple. I arranged pony beads in a 9 inch cake pan, don't spray it or line it with anything. I just lined them up, starting with the red, then the orange, and so on, following the curve of the pan. I used the translucent ones rather then the solid ones, but that is just because I wanted to have the light shine through it. Do what you want, not judging you at all. Now, I need to melt them. Here is where I got a little creative. This is not some new project that I created. 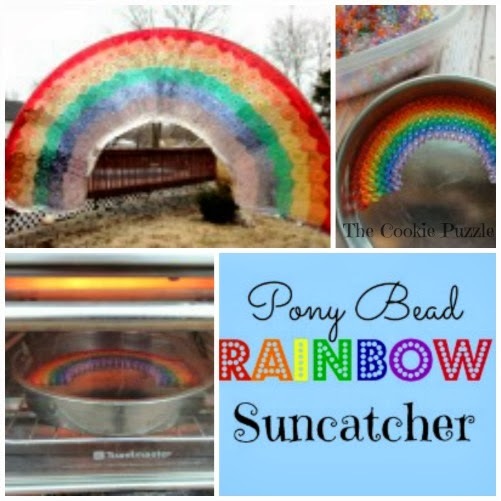 I can not take credit for it at all, there are 8 gazillion tutorials online to follow, just Google "melted bead suncatcher" or "bead suncatcher". But, what concerned me about them all was the warning of a "melting plastic smell" that came from the oven when you melt the beads. Now, I don't know about you, but that smell is GROSS..and it hangs out in your house for like a long time and as I mentioned, is is cold here, and snowing, so opening the windows is not an option that I had. So..I moved to plan B. Plan B for me was taking my 'craft only' toaster oven outside and doing the melting out there. Yep it was cold, and I got snow on my, but that was ok, my house did not smell like melted plastic when I was done. 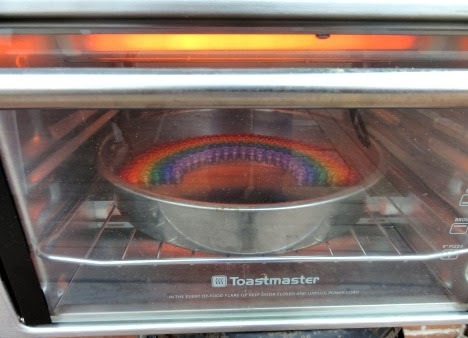 So, I set my toaster oven to 450, and let it warm up, then I placed my pan of beads in it, and closed it up. Within a few minutes, smoke was billowing out, and yucky smell too. I was happy with my decision to take this project outside. 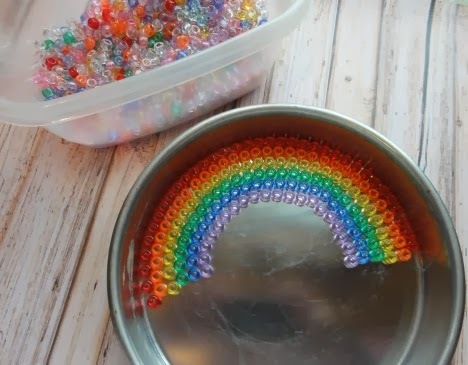 I just watched carefully, and within 5-7 minutes, the beads were all melted. I then removed the pan, and set it on my deck table on a hot pad to cool. I high tailed it back in the house to warm up. I went back outside in 10 minutes and with very little effort, I had this! Pretty, isn't? I raided Collin's fishing kit, and stole borrowed some clear fishing line and tied it around the rainbow ( you can barely see it in the picture in the middle of the rainbow), hung it from my arbor, took a few pictures and ran back inside just as the snow was starting to fall. I plan on making more of these, as they are so simple. My next project will be a tray or cake stand I think. *If you plan on using a toaster oven like I did, make sure your pan will fit in the toaster oven before you lay your beads out. *Once the beads are melted and cool, they come out of the pan pretty simply, but if needed you can GENTLY help it along with a sharp knife. *When the melted bead are cooling, you might notice some "popping" sounds, that is ok, that is the beads releasing from the metal pan. *You can drill a hole in the suncatcher with a drill, just make sure you don't do it too close to the edge, or it will crack. *If you do crack it with a drill or dropping, it can be "repaired" by placing it back in the toaster oven for a few minutes. There you so...simple easy and fun. The kiddos would love this for sure, with a little adult supervision, you have a great project that can be used as a gift for anyone, because who doesn't love cute gifts from the kiddos? 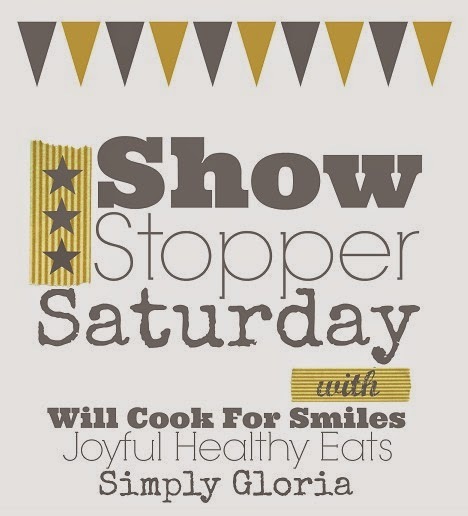 Don't forget to head over to Simply Sweets by Honeybee to see all the other projects this month. You are sure to see some amazing projects. Happy Sunday blog friends. Another week has come and gone...not much as happened here, and I am OK with that. It is early on a Sunday morning, and as I look out the window, I see snow...yep..SNOW...in March, and under that pretty snow, is a thick layer of ICE. Our pastor just called and church had to be cancelled. The department of transportation as issued "No Travel" warning, so it looks like a lazy Sunday for us. I have some cookies I need to bake for my mom's Historical Society Meeting, simple flowers, and maybe a recipe or two that I would like to try today, if I can move from the couch. I was able to get a craft project done yesterday before the ice and yuck came, and even some good photos taken, hopefully I can share it with you tomorrow. My two favorite shows started again this week. Grey's Anatomy was back, I will not spoil it for you, in case you have not watched it yet...but I was very happy with how it came out. Scandal was amazing as ever. I started watching it in the middle of last season, and I keep meaning to go back and watch the first seasons, but never have the time. What really has me excited this week is the book that I started last Sunday and only have 50 more pages to read before it is done. Last week on the blog, I asked for suggestions on what I should read. Melissa of My Recent Favorite Books, suggested that I try the Cedar Cove Series by Debbie Macomber. I downloaded the first book 16 Lighthouse Road, and was HOOKED! It is set in a little town in Washington, and is simply AMAZING. Melissa described it as a "clean" romance with a little mystery. OH WOW was she right! It follows the lives of the people in this small town, it bounces from person to person, from house to house, from couple to couple, BUT, it is so easy to follow. I am hooked. With me being stuck at home today, I am sure I will finish this one, and start on the second one. It has been nice reading along with Collin the last few years, but I think I have read enough young adult books for a bit.time to read for ME. Thank you so much Melissa, your suggestion really was spot on. Just one post this week here. Until next time...stay warm and stay safe.